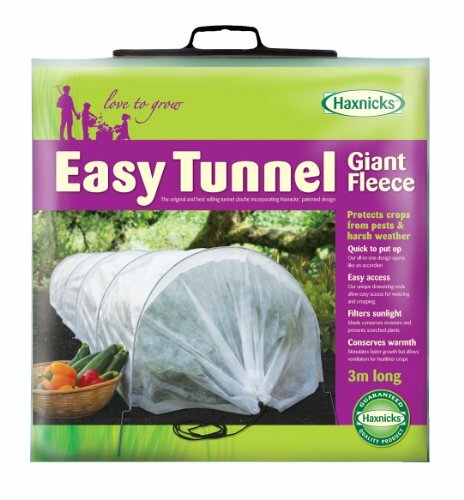 Whether extending your harvest into the fall or getting an early start for spring vegetables, the Haxnicks Giant Easy Fleece Tunnel creates warmth and insulation while allowing water and sunlight to filter through to the plant. Forms a barrier against frost and harsh weather, animals, and pests. Can be used as a mini greenhouse in the summer. Made from UV-stabilized, 45gsm heavy-weight polypropylene fleece and rust-proof galvanized steel hoops. Quick to set up, the tunnel is a 1-piece design that opens like an accordion and fold neatly away after use. Ends of tunnel have open and closable drawstring allowing variable ventilation or completely closed protection. Generous size - 9.8 feet long, 24 Inches wide, 18 Inch high, great for larger plants or cover a double row. Easy to use, easy to move and easy to store! Also availalbe in smaller size, as well as other materials. For nearly 20 years, the Haxnicks company has been designing and manufacturing innovative garden care and plant protection products for their customers in England. Tierra Garden is proud to offer this distinctive line in the United States. Forms a complete barrier against frost and harsh weather, animals, and pests, and creates warmth and insulation while allowing air, moisture, and sunlight to filter through. Quick and easy to use, Easy Tunnels are manufactured as a patented, one-piece design that open like an accordian and fold neatly away after use; it's a breeze to setup and put away! Made from long-lasting UV-stabilized, 45gsm heavy-weight polypropylene fleece with rust-proof, galvanized steel hoops, which easily go into the ground to secure and keep the tunnel in position. Drawstring ends allow access and degree of desired ventilation for your plants; steel hoops allow you to use the entire length of the tunnel or set it up to your desired length.